Asby Endowed took two teams to the Long Marton tournament on Monday 22nd May. The football team won one against Crosby, lost one against Long Marton and drew one with Temple Sowerby. The team was Ted, Hollie, Aaron, Oleina, Jay, Joe and Herbie in goal. Ted scored with a fantastic goal against Crosby! 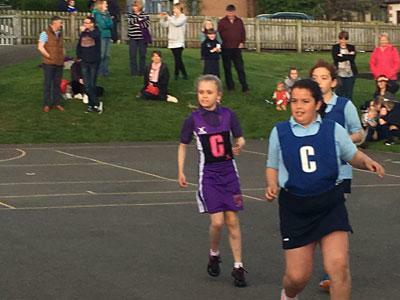 The netballers only had two matches and played Brough and Warcop. The team included Bethany, Tiegan, Amy, Sarah and a couple of borrowed players from Long Marton. 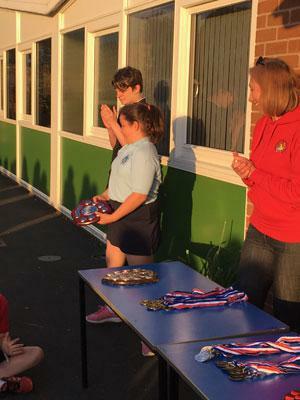 All the players, played extremely well and Bethany in particular stood out and was awarded with the Player of the Tournament Trophy. A strong performance by Asby saw them dominate most of the match with Aaron, Oleina, and Jay strong in defence and Herbie confidently guarding the goal. 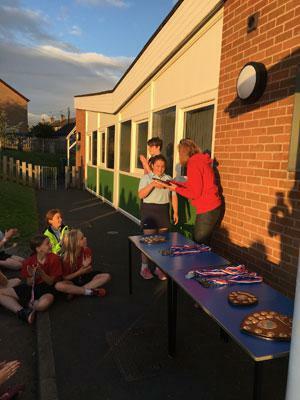 The combination of Ted's skill and pace, Hollie's determined tackling and strong running, and Joe's paced running almost overcame Temple Sowerby. Herbie didn't have a shot on target to save. Asby were unlucky not to win the game. Another excellent team performance saw a repeat of the first game but this time Ted's fantastic strike mid way through the match, following great link up play with Joe and Hollie, took all three points for Asby. Some resolute defending and tackling from Aaron, Oleina, and Jay with Herbie confident in goal held onto the lead. Asby continued to make good chances with Joe and Ted both going close and Hollie just denied some shots on goal. Going into the match Asby knew a win was needed to get into the final as Long Marton had won both previous games. The team were certainly up for the challenge and had a good start to the game, holding their own against a very strong team. With Long Marton launching a series of attacks, some desperate defending was required. Asby did have several good attacking moves but found themselves crowded or tackled out. Finally Long Marton got the break-through after Asby failed to clear the ball with a second goal finishing the job in the second half. The Long Marton defence held firm. Asby were the only team to have no substitutes so every player played a full three games and did remarkably well. There was some great support from the sidelines from a strong Asby parent group and very vocal encouragement from ex-player coaches Thomas H and Thomas N as well as previous winning captain Adam-B.